McGuire PTO meets in the media center on the third Monday of every month (Regular 2015-2016 meeting time TBD at the Aug 24th Meeting). All parents are encouraged to attend. Connect with other parents of McGuire Mustangs on Facebook. Follow our Facebook page to receive updates on meetings and PTO sponsored events.Visit now by clicking the image below. Seeking New Volunteers for the 2015-2016 school year… Join us! PTO is vital to many of the great programs we are able to offer our students and your support is greatly appreciated. Whether you are interested in a leadership position or volunteering for events throughout the year, join us for our next PTO meeting to learn more about McGuire PTO. Are you organized? Do you like coordinating volunteers and publishing communications? You could be the next McGuire PTO Vice President...email us at pto.mcguire@gmail.com for more information on the roles and responsibilities. Morning ﻿Playground ﻿Supervisors are needed to help students stay safe during drop-off. Could you give 30 minutes each week? Each month? Contact Principal Susan Renaud for more information on how you can help. Note: District paperwork and background check required for this volunteer opportunity. Click on the link below to complete the online volunteer form. You can help us raise money for McGuire by donating ﻿﻿﻿﻿Box ﻿Tops in bundles of 50. Find labels on many of your favorite foods and general merchandise. Save us time by cutting labels on the dotted lines. 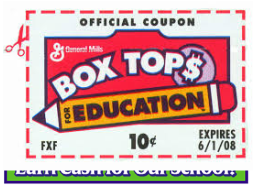 If you are interested in helping us organize box tops, contact a board member or email us at pto.mcguire@gmail.com.